Auto Grease Filling MachineOur auto grease filling machine has tin lifting arrangement which is provided for efficient grease lifting purposes. This auto grease filling machine is electro pneumatically operated and made by using excellent grade stainless steel and mild steel. It is known for its low electricity consumption as it requires only 415 V of alternating current. 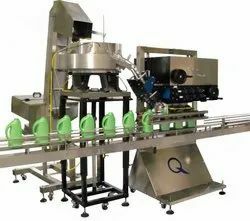 Our auto grease filling machine is widely demanded in packaging lines of different industries for providing smooth packaging operation and high accuracy. Furthermore, it is also equipped with volumetric filler and transfer conveyor. Packing range: 200 gm to 5 Kg. Filling accuracy: Â± 0.5% of HPS At S. O. P. and S. O. C.
Space requirement: 6.1 Mtr. x 1.5 Mtr. Fill accuracy: Â± 0.5% of HPS at S.O.P. & S.O.C. Augur drive motor: 1 H.P., 3 phase, 415 V A.C. Looking for LUBE & GREASE FILLING MACHINE ?